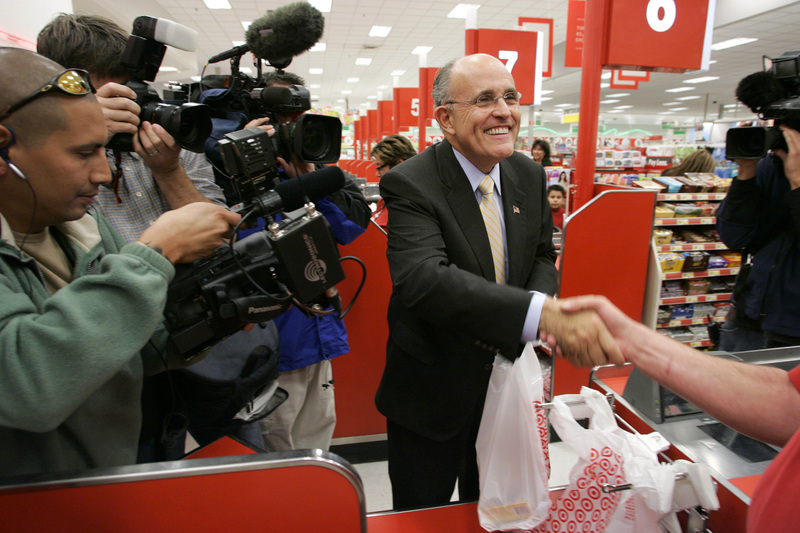 Republican presidential candidate and former mayor of New York City Rudy Giuliani shakes hands with a cashier after shopping at a Target store in the Boca Park Marketplace shopping center in Las Vegas on March 28, 2007. Giuliani's Credentials: Six years ago, Rudy Giuliani stood out as a giant, a calming, strong presence in the wake of the terrorist attacks on the World Trade Center. The former New York City mayor was so admired for his post-attack demeanor that Queen Elizabeth II knighted him and Time Magazine named him Person of the Year for 2001. But will Republicans dub the former New York City mayor as their nominee for 2008? Some of the stardom that Giuliani enjoyed during the months following the terrorist attacks has dimmed as the years have rolled by. New Yorkers, for example, don't see him as quite the hero figure any more -- they remember the pre-9/11 mayor who had a rocky relationship with segments of the city. And there has been some smoldering controversy about the quick cleanup efforts at Ground Zero, from health advocates worried about asbestos dust to conspiracy theorists concerned evidence was destroyed as truckloads of debris were hauled away. But recent polls have showed that Giuliani is still "America's Mayor" to many Republicans, outdistancing his nearest GOP rivals by more than 15 percentage points in key delegate states. The biggest reason Giuliani is not running away with the nomination is that conservatives in the party don't like his moderate stands on social issues and his troubled personal life, including his three marriages. As mayor, Giuliani was an advocate of abortion rights, gay marriage and gun control. But now that he's running on a national platform, he emphasizes that he's personally opposed to abortion and gay marriage and says states should decide gun control issues. However, Giuliani has also been a strong defender of George W. Bush's war on Iraq, and won some points in an early debate when he chastised presidential rival Ron Paul for suggesting the U.S. brought the terror attack on itself by its longtime Middle East policies. Experience: Giuliani began his professional career as a clerk for a U.S. District Court in the Southern District of New York. In 1981, he was appointed Associate Attorney General and U.S. Attorney for the Southern District of New York City in 1983. In 1989, Giuliani ran for mayor of New York City on both the Republican and Liberal party tickets, but lost. He ran again in 1993 on the Republican ticket and was elected as the city's first Republican mayor in a generation. In 1997 he was re-elected for a second and final term. After leaving the office of mayor, he started a consulting firm specializing in crisis and emergency planning and in 2005 Giuliani became a partner in the law firm of Bracewell & Giuliani. Notables: During his reign as U.S. Attorney General for the Southern District of New York, Giuliani became known for cleaning up the crime in New York City with his prosecution of 11 organized crime figures, including the heads of New York's five families. Giuiani's political views have changed over his thirty plus year political career from Democrat and Independent in the 1970s to socially liberal Republican in the 1980s. He has been married three times; first to Regina Peruggi, then Donna Hannover and is currently married to Judith Nathan. While attending the Catholic funded school, Manhattan College, Giuliani considered joining the priesthood but decided to attend NYU after graduation instead. Giuliani on the Issues: A look at where Giuliani stands on the issues and how he has voted. Nevada Contributions: A breakdown of Giuliani's contributions from the Silver State. State by State Contributions: A breakdown of Giuliani's contributions across the U.S.
Giuliani's MySpace Page: Read Giuliani's profile information and leave a message. Giuliani's Facebook Page: Read Giuliani's profile information and leave a message. Giuliani's Flickr Page: View Giuliani's photos from the campaign trail. Giuliani's YouTube Videos: View Giuliani's latest political photos. Giuliani's Blog: View Giuliani's official campaign blog. Rudy Giuliani President Committee Inc.
– Las Vegas Sun new media managing editor Dave Toplikar and intern Jenna Kohler compiled this report.